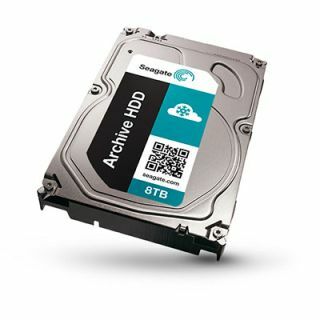 Seagate is now shipping a new line of high-capacity, low-performance hard drives it's calling "Archive HDDs." But what they lack in speed, the drives make up for in cost: $260 gets you a whopping 8TB—just over 3 cents per gig. The drives use a new technology called shingled magnetic recording (SMR) which lets you store more data on fewer platters, but at the cost of performance. The technique increases the drive's areal density, letting Seagate store 1.33 TB on a single platter, as opposed to around 1TB using conventional perpendicular magnetic recording. This means an 8TB drive can be achieved with only six platters, reducing production costs, energy consumption, noise, vibration—all the side effects of a hard drive's moving parts. The problem with SMR is it reduces HDD performance considerably. Seagate's drives (there's also a 5TB and 6TB model) spin at 5,900 RPM with a 128MB cache and average read/write throughput of 150MB per second. But paired with a nice SSD, these drives look to be a nice option for tons of long-term storage. The drives are currently being shipped to retailers, and should be officially available in early January.